Chris Christie, a GOP Moderate? Fuhgeddaboudit! The governor needs to peddle a moderate image to win re-election in New Jersey, but on everything from reproductive rights to the environment to austerity, he’s very conservative. When New Jersey Governor Chris Christie was asked in mid-May about his political bona fides, he replied, “I’m a damn good Republican and a good conservative Republican.” Believe what he says—especially the “conservative” part. Sure, Christie goes out of his way to say nice things about President Obama, who worked closely with the governor to provide immediate and essential support to New Jersey communities battered by Superstorm Sandy. And yes, Christie’s been willing to call out some of the most absurd excesses of his fellow Republicans. But these gestures are about style, not policy. The first-term governor has been meticulous about positioning his fall re-election campaign as a “bipartisan” effort. Christie knows that New Jersey, which gave Obama 58 percent of the vote last November and sends two Democrats to the US Senate, has a long history of preferring Republican moderates—like former Senator Clifford Case and former Governor Christine Todd Whitman—over conservatives. To a greater extent than most Republicans running in the busy 2013 election season (Virginia will also elect a governor this year; New York, Boston, Atlanta, Seattle and other big cities will elect mayors), Christie is mounting the sort of broad-appeal campaign that used to be typical of Grand Old Party contenders at the municipal and state levels. For Christie, this is a strategic necessity. He makes little effort to hide the fact that he is looking for a big win in a big blue state—one that will propel him into contention for the presidency in 2016. While other prospective candidates play it coy, the bodacious governor pops off about “if and when I ever decide to run” for the presidency. 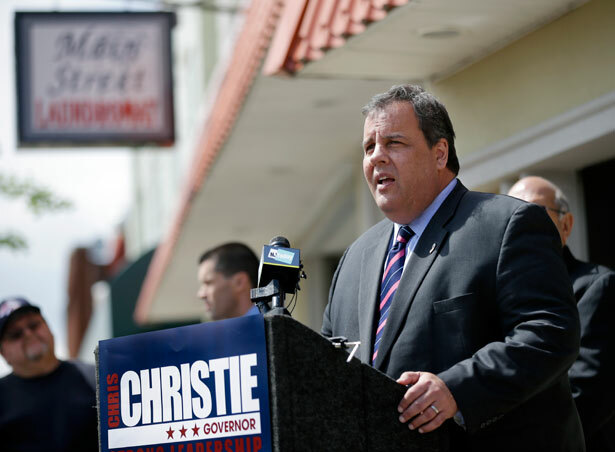 But Christie also knows his party won’t be looking for a Northeastern moderate in 2016. The GOP has never been more conservative than it is now; and while the motivation to win may be powerful, the common wisdom among the folks who actually nominate presidential candidates says that experiments with supposedly “mainstream” figures like John McCain and Mitt Romney will not be repeated. So Christie is executing a delicate maneuver. He needs to run left this year to pump up his gubernatorial re-election vote numbers, and then pivot right in states like Iowa and South Carolina. Amid all the gamesmanship, it’s easy to lose sight of where Christie is really coming from—unless you look at his record. Christie is no moderate. He’s a social conservative who opposes reproductive rights, has defunded Planned Parenthood and has repeatedly rejected attempts to restore state funding for family planning centers. He has vetoed money for clinics that provide health screenings for women, including mammograms and pap smears. He vetoed marriage equality. Christie is at his most militant when it comes to implementing the austerity agenda associated with the most conservative Republican governors. There’s a credible case to be made that he is “doing a Scott Walker on New Jersey,” as a Garden State headline suggested in early May, after the governor proposed gutting civil service protections. Christie makes no bones about his admiration for the Wisconsin governor, whose anti-labor crusade inspired mass protests, a recall attempt and miserable job-creation numbers. And Walker says he’s taken inspiration from Christie, who since his 2009 election has been bashing public employees, ripping teachers and matching tough talk with even tougher cuts. The Newark Star-Ledger says Christie “has made his battle with unions a centerpiece of his first term,” and the governor doesn’t disagree, declaring, “I think unions are the problem.” Under Christie, the minimum retirement age for state employees has been increased, as have contribution requirements for benefits and pensions. He’s attacked tenure protections for teachers, and according to the New Jersey Education Association, since Christie’s election “teachers and school employees have seen their budgets slashed, their colleagues laid off, their class sizes increased.” It’s not just the public sector that has taken hits: the governor has used his veto pen to block minimum-wage hikes and pay-equity legislation, and he has cut the earned-income tax credit for the working poor. At the same time, Christie has rejected tax hikes for billionaires and found plenty of money for corporate tax breaks and giveaways. As with other governors who have gone the austerity route, Christie is proving that budget cuts and constant wrangling with unions is bad for the economy. New Jersey’s unemployment rate has been way above the national average since 2011; it’s currently the seventh-highest in the country and the worst in the region. New Jersey also has the nation’s second-highest percentage of mortgage loans in foreclosure. And the highest local property taxes. This week, Nation editor and publisher Katrina vanden Heuvel blogged about the New Jersey governor’s cavalier attitude toward climate change in the wake of Hurricane Sandy’s devastating effect on the Jersey Shore.